….does not a summer make" said Aristotle – that’s as maybe but this morning I have seen the first swallow of 2015 and it definitely feels like summer is on the way. It is a mesmerising sight to watch the swallows swoop low across the fields gathering up insects for food. Every year these amazing little birds make the journey from southern Africa, across the Sahara to breed in the northern hemisphere. 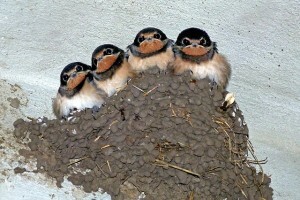 They return to the exact same nesting sites year after year. It is said that the swallow’s forked tail comes after an angry God threw a firebrand at a swallow that was stealing fire for the people. As it flew away the firebrand burned away the middle feathers of the swallow’s tail. The real reason is much more mundane in that having a fork in the tail increases the efficiency of flight. For a few weeks now, the curlews have been seen and audible over the fields locally. I always think that they look rather out of place with their long, slightly curved bills, much suited to feeding in soft sands and muds of the coast. They really do grace us with their presence. They can feed successfully on insects in the shorter grazed grass of managed farmland, especially if the ground is slightly boggy. Quite often you can hear them without seeing them. They make a very distinctive plaintive sound from which the bird gets its name. They choose to breed in inland areas. They build their nests on the ground, primarily on moorland. For that reason, if you are out in the summer walking your dog on the moors, please do keep it on a lead. Another migratory bird that visits for just a few months before returning to northern Africa is the Ring Ouzel. It looks very like a blackbird but has a tell tale white band across its chest. 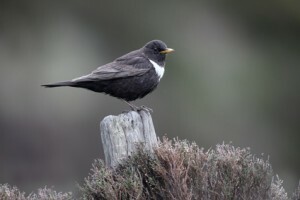 The name “Ouzel” comes from old English and means “common blackbird”. The Ouzel is very shy of humans, unlike the blackbird, which probably explains its now relative rarity. The Ring Ouzel feeds on worms and insects and on berries in the autumn. 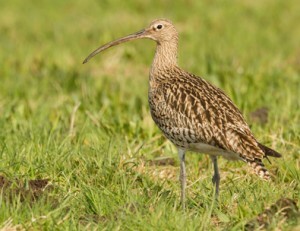 Like the curlew, it also nests on moorland, under heather or bracken. Unfortunately, numbers in the Peak District are declining so this is the bird that you will have to work the hardest to spot.